Anderson’s Father John Hind moved to Crowle not long after he and Elizabeth Anderson were married in Epworth on 3rd October 1800. In 1802 John Hind bought a Corn Mill in Crowle from Mr James Turner. This was the year in which Anderson, the eldest child of John & Elizabeth, was born. 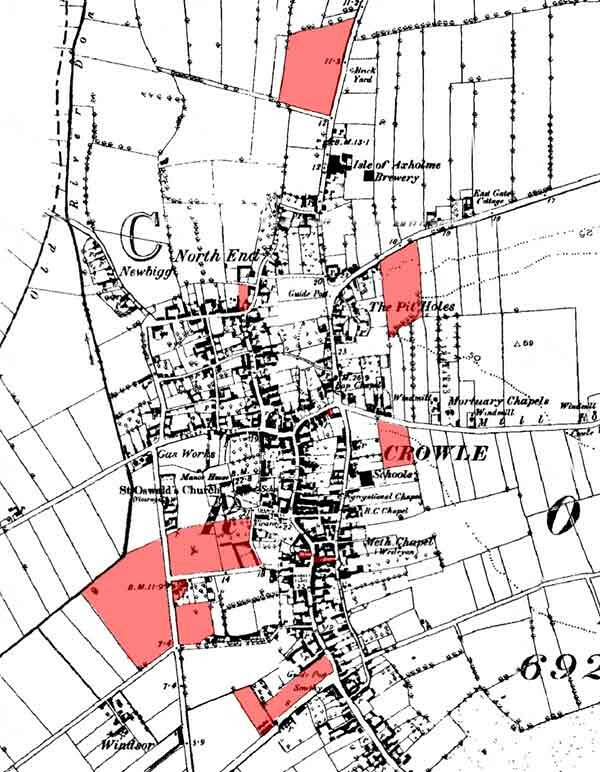 In 1853 the when it passed to Anderson and his brothers the mill is described as being a “Plot of land in Crowle field, marked as 42 on the enclosure map and known as Mill Close and also Brick Smock Corn windmill with Stable and Buildings”2. Anderson was clearly destined to follow in his father’s footsteps as he is shown as being a Miller along with his father in the 1828 and 1835 Pigot’s directries. In 1829 Anderson began to rent land from Thomas Lightfoot. Initially Anderson rented 35 acres of warpland at £50/acre, though in 1830 this reduced to £42/acre. In 1837 the acreage was increased to 64. It appears that the original 35 acres was known as Canal Side. Apart from this the account book does not detail the acreage that was rented. By 1879, when the account books finish, Anderson Hind was paying £679-10 each half year for the land, then rented from R.P Johnson. During the time that Anderson was farming this land it had passed from Thos lightfoot to his son T.S Lightfoot before being sold to RP Johnson. The 1851 census describes Anderson’s occupation as Farmer, 700 acres and in the 1861 his occupation is further elaborated as Farmer 700 acres employing 13 labourers and 7 boys. Clearly most of the land he farmed was rented though unfortunately the surviving rent books, described above, at the Lincolnshire archives do not appear to detail all his rented property. In 1871 census although he is still described as a farmer, the acreage quoted is only of 60 acres which approximately equates to the land he actually owned. I believe that by then, at the age of 70, he had effectively retired. The 1881 census describes him as a farmer. The land Anderson Hind actually owned himself was built up over his life. The land was acquired in bequests from his Father and Matthias Dudding in addition to being purchased from a number of people. In addition to the land Anderson Hind built up a portfolio of buildings, including 2/3 shops, farm buildings in Crowle, houses, a farm in Haxey and a property in Doncaster (which may have been a pub). It appears that from at least 1841 Anderson lived at the Tithe House, a house no longer standing but was situated on Vicar’s walk where Manor Gardens sheltered housing is now located. It is likely that the farm house came with renting land from Thomas Lightfoot as he owned the house. In 1859 Anderson bought the house along with a number of other properties from TS Lightfoot. In 1885 the Tithe House failed to sell at Auction and it was eventually sold in 1900 to Wiliam Wainman, who had been renting the property from the trustees of the will for a number of years. The house became a convent, with girls’ school, some time early in the 20th century. The convent closed sometime early in the 1950s’ and was left empty for a number of years before being demolished to make way for Manor Gardens. I understand that the house was originally built around 1721 by Richard Clark and that on his death he was buried in the grounds. His will appointed three trustees to adminster his will, his son-in-law William Henry Mallett of Nottingham, a Lace Manufacturer, Samual Simpson of Doncaster, Land Valuer and his Solicitor, Alfred Parkin of Doncaster. £100 to each of the trustees of the will and Alfred Parkin to be paid for his services. £30 annuity for Susannah Whitely, the house keeper of Matthias Dudding, which was required under Matthias Dudding’s will. £2000 to the children of his late son Joseph Hind when they attain the age of 21. The investment income from this legacy to be provided to Joseph’s Widow Mary Hind. £2000 to obtain annual income for maintenance, education and support of the child of his late Daughter Mary Hudson. £2000 for the children of his late son James. The investment income from this legacy to be provided to James’s Widow Mary Ann Hind. £2000 to the children of William Anderson Hind. The investment income from this legacy to be provided to Clara Hind. £2000 to be set asside to provide interest to Ann Dewsbury (his Daughter) and on her death to be split amongst all her children. £666 for maintenance support etc of Sarah Elizabeth Wainwright, daughter of my late grand daughter Sarah Ann Elizabeth Wainwright. £30/year to General Baptist Society at Crowle. To Grand Daughter Elizabeth Hind, daughter of Joseph Hind – his Wife’s Watch. To Alfred Parkin £300, being the amount adavanced to his son William Anderson Hind. I direct that the children of my son William Anderson Hind shall take equally the share and interest which under my will WA Hind would be entitled. Daughter Ann Dewsbury £1000 in addition to the provisions of the will. It appears that WA Hind had repaid Alfred Parkin. Also the furniture and household effects bought for William Anderson Hind were to be divided amongst his children. Probate was granted on 16th June 1885 and Anderson’s Gross personal estate was valued at £15,934-6-9. A considerable amount which at 2006 value is £1.4m9 or so, though if this were calculated using land and property values would be significantly more. On the 16th & 17th December 1884 the trustees held an auction at the Tithe House to sell all his personal effects, household furniture, livestock, produce, implements and a four wheeled phaeton coach and harness. 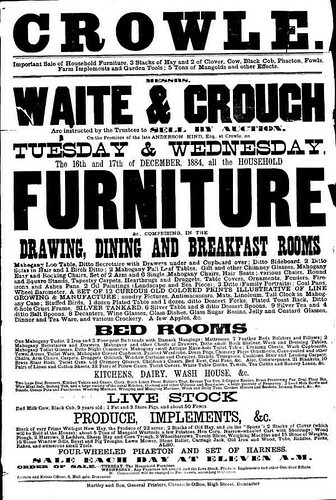 The auctioneer’s poster makes interesting reading as everything from a mahogany ‘loo’ table (card tables to play a card game called Waterloo) to toilet covers, copper kettles, dolly tubs are listed. The Live stock includes a Red Milk Cow, Black Cob, 9 years old, 1 fat and 2 store Pigs and about 50 fowls. The agricultural part of the sale included stacks of hay, clove, mangold wurtzels in addition to farm implements. It appears that the produce was in the ‘spens’ which may have been all that he was cultivating – the rest being rented out. 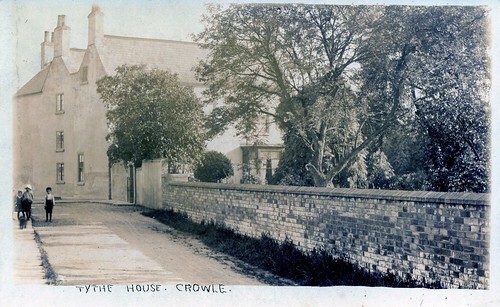 The property in Crowle was initially auctioned on the 29th May 1885. Although 21 lots (see appendix 1) were put up to be sold only 8 lots were sold raising a total of £2006-1-4. The unsold properties were rented out for a total rent of £281/year. It was not until 25th Day of June 1900 at the Darby and Joan Hotel when the remainder of the property in Crowle was sold. Coneygarth Farm in Haxey was put up for sale at the Duke William Inn, Haxey on 30th July 1900. 15 years seems an exceptionally long time for the Trustees to eventually sell Anderson Hind’s property, however one needs to remember that British agriculture had started to go into recession from 1870 and clearly the 1880’s were not a good time to be selling farm land. Lot 1 – All that Freehold Messuage or DWELLINGHOUSE, situate near the Church, with out-offices, barn, Farm Buildings, Carriage House, Ornamental and Kitchen Gardens, Orchard, Yards, Foldyard and Stackyard therto belonging known as Tithe House, lately occupied by Mr Anderson Hind, and containing 9295 square yards. Lot 5 – A Grocer and Draper’s SHOP with Dwellinghouse, Warehouse, Stable, Coach House, and Garden thereto situate near the Marketplace having a frontage to Back Lane, occupied by Mr T.C. Horrobin containing 720 square yards. A Wine and Spirit License is attached to these premises. Lot 6 – A Freehold DWELLINGHOUSE SHOP, and premises opposite Lot 5, and occupied by Mr Wm. Armitage, containing 425 square yards. Lot 7 – A DWELLINGHOUSE Garden and Premises occupied by the Rev. Isaac Hatfield, containing 1007 square yards. Lot 8 – TWO DWELLINGHOUSES with Barn, Stable, Fold and Stack yards, Garden, and Paddock,in North Street occupied by Mr George Leggott, containing 1402 square yards. By order of the trustees for sale under the will of the late Mr Anderson Hind. Lot 8 – A Close of Freehold Grass Land called Far Ings occupied by George Otoby. Lot 12 – A close of Freehold Land called Pit Hills. Part of close taken by Axholme Light Railway. The kindness of the late R. W. Tonge, Esq., of Epworth and subsequently of his executors, made possible the deposit with the committee of a number of documents concerning the Isle of Axholme. The largest portion of the deposit is taken up with a group of miscellaneous title deeds for various places in the Isle of Axholme and neighbouring places These are concerned with a great variety of small pieces of land which were passing rapidly from hand to hand in the seventeenth and early eighteenth centuries; it has proved impossible to distinguish any groups among them. They are of considerable topographical interest and the variety of occupations of the parties throws some light on the specialised industry and commerce of the Isle for it includes weavers, sackweavers, flaxdressers and ropers and a clockmaker (Thomas Kilham) as well as mariners and ships’ carpenters. The importance of flax-growing is demonstrated not only by hempyards, hemp crofts or hemplands near to houses but to selions of arable “for hemp“ lying out in the open fields. ‘ ‘Eliers” , the low-lying area in the north west of Epworth parish which would appear from these documents to have been made up by successive intake and reclamation of small pieces of carr-land, from the 13th century onwards. There is much interesting topographical detail, which illustrates the stages of clearance and drainage.- The deeds are the title to a portion of the estates ultimately held by the numerous and important family of Maw. The most unusual feature of this deposit is the Epworth.Bapt.ist book, which is apparently the earliest survlvmg record of a dissenting community whose origms can be seen in the archdeaconal Visitation books of 1623, 1631 and 1635 (Viij/l, 2, 3). The contents of this book, which is at once register, minute book and estate memoranda book, cover the period 1673-1818 and provide much evidence, of a date considerably earlier than has been expected, of the organisation of the Lincolnshire Baptist congregations. There appear to have been fro-m the first “travelling ministers” supported by the contributions of the congregations and serving a wider area than Axholme, as well as elders and deacons elected by the individual congregations. As early as 1699 bequests were made to “the chest at Lincoln for the common stock” and representatives were regularly nominated, from 1739 onwards, for the “Association at Lincoln”. The Axholme congregations at Epworth and Butterwick met regularly to fix church meetings and days of fasting and remembrance, to arrange for the ordination of elders and deacons, to inquire into discipline and expel the few backsliders (drunkenness, failure to attend meeting and a relapse into Methodism are among the causes given) and to administer the church estates which seem to have been considerable. A certain number of ‘births and marriages are recorded; as well as occasional lists of mem bers, but it is difficult to believe that they constitute a complete record of the congregation. A similar book of the Bourne Baptist Church (1702 1891) was described in The Baptist Quartedy (vol. XV no. 5, 1954), F. J. Mason, The Old Minute Book of Bourne Baptist Church. Title deeds: Maw property in the Ellers, Epworth, 1392-1691, 16. 16881797, 5; Hatfield, 1711-35, 3. Although this information was obtained from the draft title deeds that were pulled together for the auction sale some of the information appears to be contradictory. I need to review to better understand this. 1 Tithe house on Vicars Walk – This appears to have been bought from TS Lightfoot on 3rd May 1859, though it would appear that Anderson Hind had lived here for much longer [When did Anderson move into Tithe House?]. This was not sold after the 1885 sale and was rented to William Wainman who bought it from the Trustees on Anderson Hind’s will in 1900. 2 Large Close behind Tithe house. Bought and sold with House. 3 Six Cottages on Godnow Road. The land appears to have been bought by Anderson Hind in 1842 from John Potts for £90. As the cottages are not mentioned I assume that Anderson built the cottages shortly after buying the land. 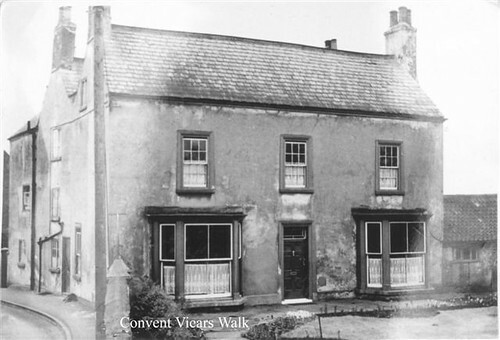 In the census these cottages are referred to as ‘Tanners Cottages’ in John Hind’s Will. 4 Two Cottages on Commonside (Corner of Potts Lane and Windsor Road). This appears to have been acquired at the same time as the Garden near Pinfold Corner from Peter Taffinder, William Taffinder and Harriet his wife and Thomas Foster. On 29th April 1847. 5 Grocer and Draper’s Shop occupied by T.C. Horobin (Now Grannie Annie’s). This was acquired by Anderson Hind in 1845 from George Nicholson and his Wife Ann for £430. Nicholson was admitted in April 1810 on surrender of John Brunyee Maw. At the 1885 Auction this was sold to Mr Thomas Crewe Horobin.for £800. 6 House & Shop opposite 5 (Between Cross Keys and George & Dragon). Thi swas acquired by Anderson Hind in 1859 from TS Lightfoot, who had been left the property in the will of his father T Lightfoot, who died in 18 Nov 1858. When Thomas Lightfoot was admitted in 1826 the property was described as Yard, Saddler’s shop outbuildings and appts near market place now in the occupation of of William Moody bounded to the east by Town Street, West W Cundall (late Maw Venables) on North by Mr Glossop (late Staries) and on South by the Cross Keys inn. At the 1885 auction this property was sold to SC Brunyee for £225. 7 House in South End (Not identified yet!). 2nd November 1854. Anderson Hind acquired the property from Cornelius Van Valkenburgh Thompson (late of New Buckingham Treet, New Kent Road now of Cold Harbour Lane, Clerkenwell). Described as “All that cottage or tenement formerly described as a “common right cottage” house situated at the North End of Crowle wherein Miss Sarah Thompson, formerly dwelt. Garden Orchard etc. Bounded by Benjamin Snowden purchased of Robert Popplewell Johnson on the North, The Asker Lane or Church Lane or Church Road South, the Town Street East and by cottages belonging to Abraham Burkinshaw? Late of the estate of the ?? of John Dowson on the West and now in the occupation of A Hind to which said cottage or tenement the said CnVV Thompson was admitted. 9 Broad-Fleet Croft, referred to as Orchard Croft on Plan (Half of the old Kitchen’s site at the corner of High Street and Godnow Road). Acquired by Anderson in 1837 for £194. This was part of an ancient enclosure allotted to JS Woodruffe. Sold at the 1885 auction for £280. 15 Brickyard Close (On Brewery Road) – Acquired by Anderson Hind from John Fletcher 18 April 1839 for £415. In the original deeds this close seems to have been called Grime Hill Close. The lane to the south was known as Grime Hill Road. 16 Yorkshire Right (On Yorkshire Common). 17 Ings Close (On Eastoft Road halfway between Crowle and Eastoft.) This is mentioned in John Hind’s Will and is originally bequeathed to Thomas, though the Codicil split the estate three ways. 8th March 1868 Surrender of Ings Close by Joseph Hind of Orton Waterville to Anderson Hind in consideration of the sum of £420 advanced by Anderson. Joseph Hind originally admitted 5th May 1858 on surrender of Sayles Scholey. 18 Far Ings (On Eastoft Road halfway between Crowle and Eastoft.). This appears to be the “3 closes or pieces of land” mentioned in Matthias Dudding’s will..
19 Sands Causeway Close (On Eastoft Road halfway between Crowle and Eastoft.) This was left to Anderson by Matthias Dudding on his death in 1859. Matthias Dudding had acquired the land in 1826 James Lisle for £87.10. I have a Court document dated 1848 for the sale of Crowle Manor to Anderson Hind from Thomas Maw and James Taylor. I am trying to find some information on James Taylor. Thank you. Hi Anita, The document you have sounds like an admission document which is what was issued by the Manor Court to show that ownership of property or land had changed hands – and also gave revenue to the Lord of the Manor. Can you scan/photo the document and email it to me on angus@townley.com – I should be able to tell you a little more about the property described. I will see what I can find out about James Taylor when I get home tomorrow. Many thanks. That makes more sense now because both men are described as farmers and the sale was for an insignificant sum of £99. I can’t read most of it because the writing is old and faint but the paper is in excellent condition. It is A3 but I will do my best to scan it and send it to you tomorrow.